The American Veterans Ball is Proud, Honored, and Blessed to announce that Patriotic Veteran Music Performer Mr. Dave Bray (Dave Bray USA) will be performing at the Fredericksburg EXPO & Conference Center – Fredericksburg, VA on Veterans Day November 11th, 2017. Dave Bray is a dedicated husband, father, and musician. He grew up in the rolling hills of Pennsylvania, where he currently lives with his wife and 2 boys. Dave proudly served in the U.S. Navy as an 8404 FMF Corpsman for the 2nd Battalion/2nd Marines, (STA PLT), stationed out of Camp Lejeune, NC. 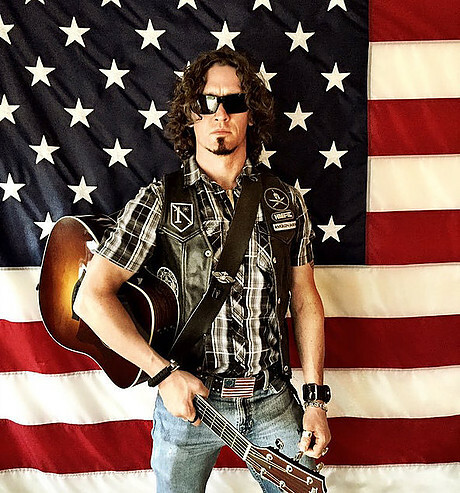 Dave has entertained people all over the world and has dedicated his musical career to supporting U.S. Veterans, Active Duty Military and First Responders. Dave looks at his music as a continuation of his service. His love of God and Country are evident in his original songs and patriotic renditions. His shows are highly adaptable to any venue and his music ranges from “Story-teller Country” to “Anthem Rock”. Dave is best known for his ability to ignite any audience with his powerful versions of the National Anthem and God Bless America. Dave has performed on Fox and Friends, ESPN, The Blaze,The Golf Channel, and several local television and radio stations across the USA. For more information visit the American Veterans Ball website.